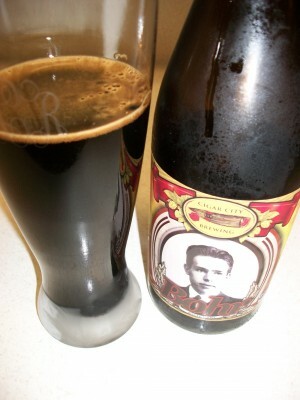 Home / Beer / Bohr From Cigar City Brewing: Too Much? Bohr From Cigar City Brewing: Too Much? This week’s Craft Beer review comes from another local (for me at least) Tampa brewer called Cigar City Brewing. I’m lucky enough to live within driving distance from their tasting room. During my last visit there, I picked up a Bohr bottle on my way out. The name comes from a scientist that I vaguely remember learning about in high school, named Neils Bohr. According to the bottle (and isn’t learning history from a beer bottle the best way to learn) his contributions to our understanding of the physical world have made him one of Denmark’s most famous citizens and one of the 20th century’s most influential scientists. In 1922, Bohr was awarded the Nobel Prize in physics “for his services in the investigation of the structure of atoms and of the radiation emanating from them.” A prolific scientific collaborator, Bohr mentored many of the great scientific minds of the 20th century. Looks: It had a light brown foam and a thick, dark chocolate (almost motor oil like) color. Bohr had an aroma that was spicy and had hints of raisins and a little bit chocolate. You couldn’t miss this taste. It was a strong and heavy. My tongue easily picked up on the hint of raisins and spices. There was also a definite, not so hidden alcohol taste. At first, it was just a little bit. However, as it warmed up, I started to taste more and more of the alcohol, until it was the dominate flavor. A little bit of sourness also came out as it warmed up. Overall, this just wasn’t a beer for me. I want to like it, but the overwhelming alcohol flavor was just too much for me. The other flavors in the beer, just seemed to get drowned out. It earned an average rating of three on the Passion For The Pint scale. And who knows, maybe it’s a beer that I’ll go back to in a couple of years and love it. I can’t wait to share with you some of the other beers Cigar City Brewing.